If you were stranded on a desert island and could only bring two spices with you, what would they be? 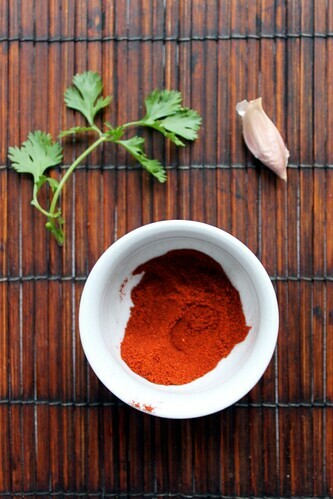 For me, this answer is simple: smoked Spanish paprika and cumin. The rich color, intense flavor, and incredible fragrance of smoked paprika makes my heart swoon, and the complex acrid flavor of cumin makes me weak in the knees. Without these two spices, my kitchen would seriously suffer. So would my taste buds! 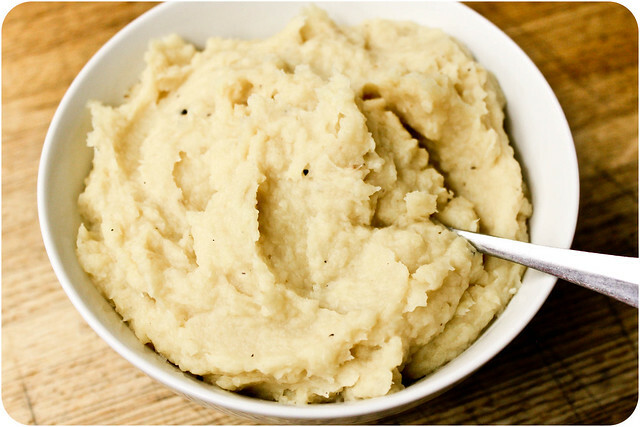 They make everything taste good, working wonders on roasted vegetables, meats and poultry, and grain dishes. My most recent spiced rice dish exhibits my adoration of smoked Spanish paprika and cumin. It also displays my love for the coriander plant, combining both the dry ground seeds and the fresh leaves (a.k.a. cilantro). These herbs and spices enliven simple ingredients and create a wonderfully flavored dish that accentuates any meal. 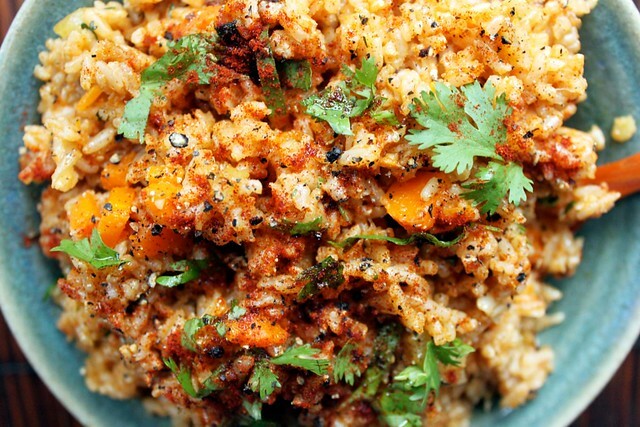 Spiced grain dishes like this one are a great staple for your weekly meal rotation. They are easy to prepare, affordable, nutritious, and wonderfully satisfying. If you have a rice cooker, making grain dishes is even easier, as you can simply flip the switch, walk away, and return to find perfectly cooked rice. I hardly ever cook rice on the stovetop anymore! 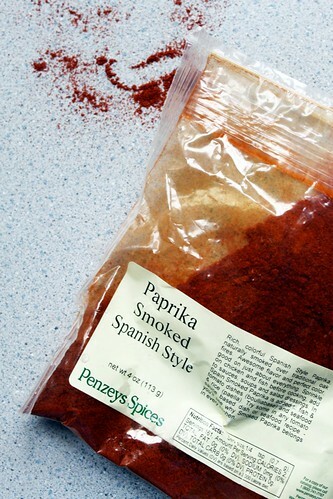 The rich, alluring flavor of smoked Spanish paprika flavors this dish. 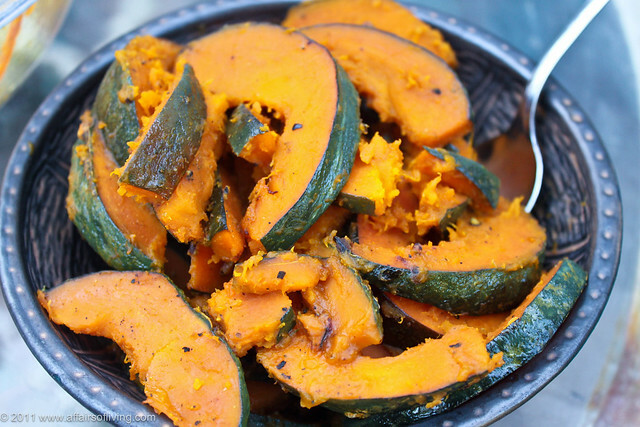 It is easy to prepare and very delicious, making it the perfect side dish for just about anything. The flavors are especially good with Mexican or Spanish inspired meals, grilled chicken or tilapia flavored with lime juice and chile powder, or Mexican chorizo. For a quick meal, top hot paprika rice with a fried egg - keep the yolk soft for an extra delicious twist - and serve with sauerkraut. Soak rice in 6 cups of water for 6-12 hours. Drain rice in a fine colander, and discard water. Rinse rice very well. 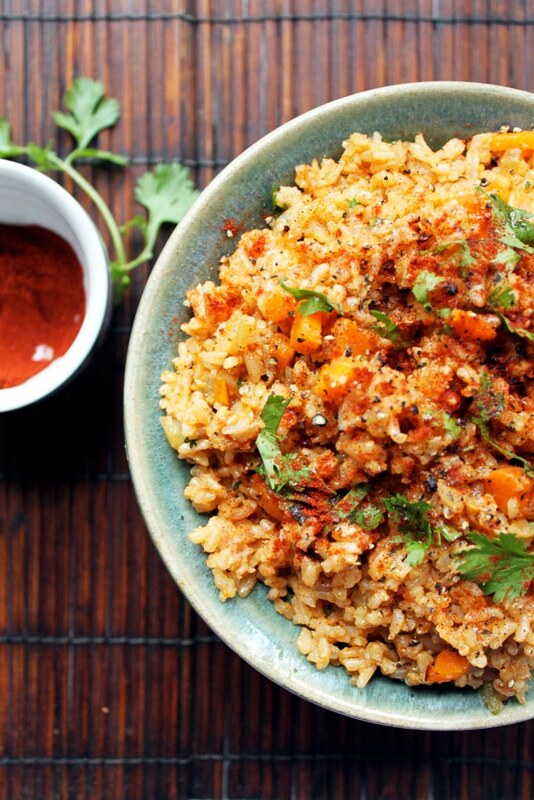 Place rice in a rice cooker with vegetables, broth/water, olive oil, salt, smoked paprika, cumin, and coriander. Stir together, then place cover on rice cooker and cook per manufacturer's recommendation. If you don't have a rice cooker, do the same thing but place in a pot on the stovetop. Bring to a boil, then cover and reduce to a simmer. Let cook about 45 minutes, until liquid is absorbed and rice is tender. Remove cover and toss rice with a fork. Add fresh cilantro to hot rice and stir, seasoning with salt and freshly cracked pepper to taste. Transfer to a serving bowl, and if desired, drizzle with olive oil and garnish with additional chopped fresh cilantro and a dusting of smoked paprika. Serve. Store leftovers in a well-sealed container in the refrigerator for up to 5 days. The other night when I opened my refrigerator, I was greeted by an eccentric mix of edibles. I had jars of rhubarb pickles, pickled beets, sauerkraut, preserved lemons, diluted coconut milk, and two massive bags of rhubarb crowding the lower shelf. Homemade mayonnaise and mustards, flax oil, hemp oil, cod liver oil, curry pastes, anchovies, and miso crowded the compartments on the door. I had beet kvass, kefir grains, a tiny amount of yogurt, a gnarly nob of fresh horseradish, lots of eggs, two kinds of hummus from the food swap, three (three!!!) varieties of homemade rhubarb sauces, and one package of elk pork sausage on other shelves. In my crisper drawer, I found a stray bulb of kohlrabi, lots of spinach, 1 bunch of kale, 2 stalks green garlic, and the requisite carrots and celery. My generally spastic lack of meal and ingredient planning seemed to be exhibiting itself in full form. Goodness gracious. I looked at that colorful assortment and wondered what in the world I would make for dinner. I had a ton of food, but it was all unusual. A woman can't live on rhubarb or fermented vegetables alone (although the last few weeks, I've been awfully close). I wasn't terribly hungry, so I defaulted to sauteed greens, dotted with onions, those green garlic stalks, and oily, rich black Moroccan olives. Those olives absolutely win me over, day or night, and I thought they would add a wonderful richness to light spring greens. I added a little broth, a little splash of balsamic vinegar, and - voila - a beautiful dinner was made! And, as a side note, while the greens cooked, I managed to eat a buckwheat muffin, snack on some cashews, and finished up two of the waning rhubarb sauces. I served them over leftover yogurt on different sides of the bowl. Geez. So much for not feeling "hungry". I felt like a fancy compost pile, absorbing whatever tasty foods needed to be cleaned out of the fridge! Finally settling down with a big bowl of these greens was a delightful end to my rather, uh, scattered dinner. You could easily substitute either the spinach or kale with equivalent amounts of another dark leafy green, such as Swiss chard, collards, dandelion greens, or mustard greens. I would recommend getting oil-cured Moroccan black olives, as the recipe calls for, if making this recipe. They have a very rich rich, oily, figgy, salty flavor that sets them apart from their conventional brine-packed black olive cousins. Find them at co-ops, natural foods stores, gourmet markets, or middle Eastern markets. They will not be packed in brine, and are considered a "dry" olive. Sometimes you can find these dry olives packed with thyme, Herbes de Provence, garlic, or red pepper flakes - any of those flavors would also work very well. If you cannot find Moroccan oil-cured olives, you could always substitute kalamata olives, which will have a very different flavor but will be better for this recipe than canned black or green olives. Slice onion. Trim the long, darker green leaves off the garlic stalk, and finely slice the head and light green portions of the stalk. Finely chop the pitted black olives. Heat oil over medium heat in a large saute pan. 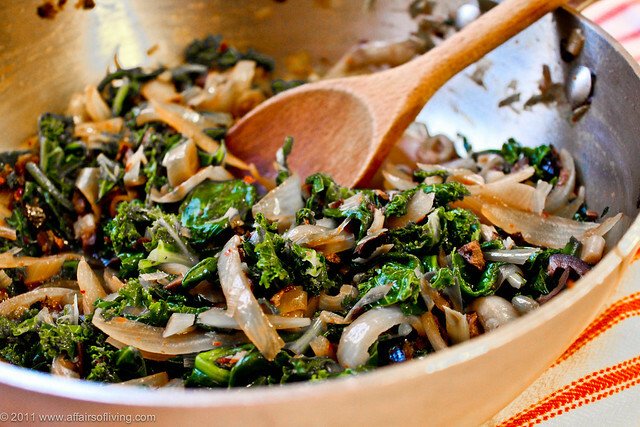 Add onion and green garlic (or leeks) and saute for 5 minutes. Then add olives and 1/2 cup broth, stir, cover, and braise for 5 minutes, stirring occasionally and replacing cover. Onions should be quite tender at this point. 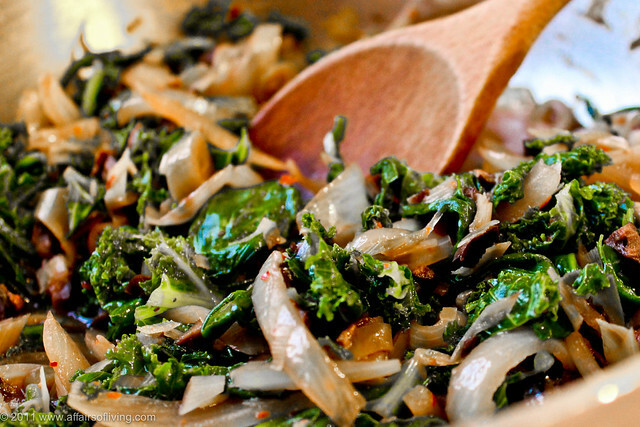 Add greens on top of onions, add remaining broth, and cover. Braise for about 8 minutes, stirring often, until greens are tender. Then remove cover and let cool for 3-5 more minutes, allowing some of the liquid to evaporate. Remove from heat and sprinkle with aleppo pepper or red pepper flakes and balsamic or lemon, if using. Serve warm. I want to share my favorite way of eating asparagus with you. I didn't get my act together to post this recipe as part of last month's SOS Kitchen Challenge, which featured none other than our green spindly friend. But that's okay, better late than never! 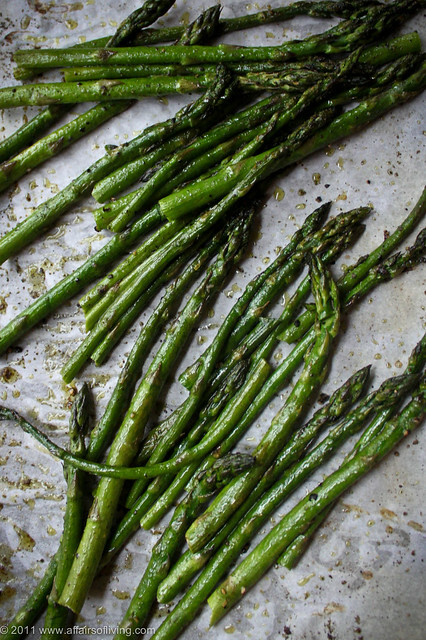 Asparagus is one of my favorite seasonal foods. And while I love it every which way, roasting it in the oven is my favorite easy way to prepare it. If you're curious, grilled asparagus runs a very close second, notched down only due to the fact that my often changing living situation sometimes makes reliable grilling a challenge. Preparing oven-roasted asparagus it is nothing earth-shatteringly unique or complicated - the asparagus are tossed with olive oil and seasonings and quickly roasted in the oven at a high temperature. It gets a little brown and crunchy at the spindly top and the stalks become tender and richly flavored. It almost tastes sweet, if you can imagine it. Plus, it looks pretty. It is my experience that even people who "don't like asparagus" actually like love this asparagus, and I have never had leftovers.